See Phase Two at the South Wedge Digital Ripple website. The Digital Ripple Project is a 30-day interdisciplinary job training program that focuses on technology, math, science, art, language arts, social studies and physical education. During this program students are introduced to and explore the intricacies of wireless mesh networking. 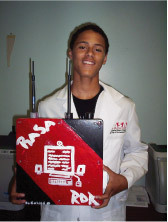 The students each participate in the construction of their own node which is used to provide a free municipal wireless internet system for the residents located within the phase one area (Edgerton Community Center and the surrounding neighborhood). The program was developed by Art for Everyone (Eric Grace, Robyn Neill, and Keith Simmons) for the Rochester After School Academy, which funded the first phase of the program. A partnership with the RIT Lab for Technological Literacy aided in the project's execution. 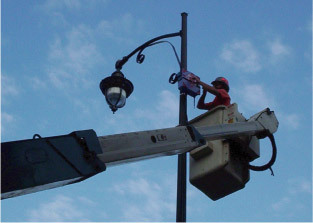 The Digital Ripple Project is supported by the City of Rochester, Rochester Gas and Electric, and Frontier who worked together to provide the Internet Access, access to the City's light poles, and power at reduced cost to enable the network to function. The network will remain active for six months as a pilot. Students also explore concepts in art and demonstrate these explorations through the visual design of their node case. Students discover the many parallels between visual and technological communications. Students make a daily record of their efforts in a daily blog spot showing their growth through the cutting edge experiences they are given through this program. The project culminates in a mural dedicated to the history of communication and to the combined effort of the students, as well as a functioning community network that will outlive the 5-week program and become the nucleus for an expanding community network at city, regional, state, and possibly national levels. Students involved in phase one of this program were paid a stipend and gained real life work experience in many fields of study in an effort to prepare them for the professional workforce. In future efforts, it would be feasible to run this program in a variety of ways, not limited to a paid summer program. Approaches such as an after school program, a Saturday program, or a credited school course are all options that have been considered. Students in this program are contributing to a community effort to bridge the digital divide. This program is driven by a 320 page curriculum that exceeds New York State learning standards in math, science, technology, art, language arts, and also addresses standards in social studies and physical education. The project is designed to be a "seed" that is replicable and is able to grow in any area that it is planted. The hope is that this program and methodology will be taught to other teachers through workshops and then spread to multiple student bodies throughout various communities. Students of the phase one effort are now in a position to aid in the spreading of this effort as intern assistants and are eager and ready to do so. Phase one at the Edgerton Community Center was funded by 21st Century Community Learning Centers and the Rochester After School Academy. The Digital Ripple Project is supported by RIT GCCIS, CASCI Labs, and the Laboratory for Technological Literacy.